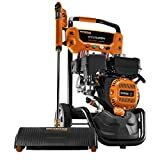 Gas Pressure Washer Reviews: How to buy the right one? Pressure washers are a great tool for cleaning large areas filled with dirt and grime build up because it does the job faster than manual scrubbing. Not to mention, you’re also saving a lot of energy and effort, as all you’ll have to do is direct or maneuver the pressure washer hose. You’ll have to pay a bit more though because the unit itself is not that cheap plus there is the added cost for water and energy consumption. But these are very minimal compared to the time and the effort you’ll be saving. You’ll also be able to cover a lot of areas in the day, minimizing the frequency of cleaning that you have to do. If you are sold on getting a pressure washer, you must decide whether to get electric or gas. The first is best used for home use as it is small and lightweight while the latter is best for heavy cleaning and commercial purposes. In this article, you’ll know more about gas pressure washers. What are the factors to consider when getting gas pressure washers? The factors below should help you decide in getting the best one depending on your needs, wants and budget. Gas pressure washers are more expensive than their electric counterpart so you want to get the most out of it. Power – You want to make sure that the pressure washer you’ll get has the right power for the job that you want it to tackle. This ability to loosen dirt is measured in pounds per square inch (psi). Most gas pressure washers are created with very high psi because the motor that comes with it is powerful enough to do so. To give you an idea, medium-duty pressure washers have about 1,950 to 2,600 psi and can clean 40 to 90 square feet in 10 minutes. Heavy-duty pressure washers on the other hand have about 2,650 to 3,800 psi and can clean 90 to 190 square feet in 10 minutes. If you intend to use the pressure washer for your home or business, you can get the medium duty one as it suffices. But if you’re going to use it for commercial purposes or for contractors, get the heavy duty one, especially if you intend to use it frequently. Water consumption – All gas pressure washers not only list the psi but also the measurement of the water consumption in gallons of water per minute (GPM). Through this you’ll know how much water you’ll use every minute you blast away dirt. It can also be used to measure the real power of your gas pressure washer; just multiply the number of the GPM by the psi. Accessories – It is best to pick different sized nozzles for your gas pressure washer to tackle all areas, nook and cranny, and hard to reach places. These nozzles mostly come with the package but it’s still worth checking. You can also have other accessories such as a rotating scrub brush, a broom attachment for pavement or an attachment for cleaning gutters. You may also want to consider a spray gun and an extension wand. Gas pressure washers are very heavy because of their large motors so you want to keep it stable where they are instead of dragging it behind you every time you have to move from one area to another. Key Takeaway: Before purchasing any pressure washers, make sure that it’s up to par with your intended use. Check the power, the water consumption, the noise, weight, fuel consumption, and accessories you may add. You want to get something that is powerful enough for the chores or jobs you intend to do, but be careful not to be so overpowered because it will have its drawbacks in the future. 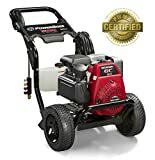 What are the best gas pressure washers? 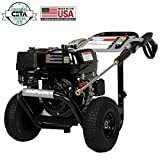 This powerful gas pressure washer has 2,800 psi that is capable of not only doing the jobs at your home but also in commericial areas such as stores or your farm. It features an ergonomic design that makes handling it much easier. The grip is molded, it has an easy-to-pull trigger, and has a rear hose connection for comfort when used for prolonged periods. It comes with four quick nozzle tips ( 0 degree, 25 degree, 40 degree and soap). Armed with a reliable Honda engine, this pressure washer can withstand hours of continued use. This is great for prolonged cleaning, especially in areas where there are huge dirt buildups. Like the Generac, the Powerstroke pressure washer has pro-style spray nozzles (0, 25, 40 degree and soap) for job versatility. It has 25 ft. non-marring high-pressure hose is great for reaching many areas. It has a 12” cap wheels that is good for maneuvering in rugged terrain. This pressure washer is armed with a commercial series engine that starts easy, runs smoothly, and delivers very high output. It features a 3,200-psi that packs a punch when in use. It is able to cover a large ground, making it efficient for use in wide areas filled with dirt buildup. The motor is housed in a welded steel frame and steel engine plate, and is carried by two heavy-duty wheels for durability and portability. It has a pro-style steel spray that comes with five quick connect nozzle tips in 0, 15, 25, 40 degree, and soap applicator. Gas pressure washers are intended for heavy-duty use. The motors can withstand hours of continued use and can propel strong water currents. This high pressure is effective for tackling thick buildups, saving you not only time and energy, but also water consumption. Because of the power it can give and the efficiency of the motor, gas pressure washers are generally more expensive than electric ones. They are also more durable and are recommended for frequent use.